What else is happening in 2011 besides an ETFE-roofed stadium at Dunedin? This project from Foster + Partners is the first in a series of international building projects What if? will highlight for completion in 2011. Scotland’s National Arena will be an exciting new addition to the expanding cultural and event hub at Glasgow’s Scottish Exhibition and Conference Centre. The new Arena will provide an outstanding indoor venue for concerts and performances. A highly flexible building, it is designed to accommodate a wide range of events – from pop concerts to grand theatrical shows. Councils will in future have to pay much closer attention to their core functions and produce financial reports that ratepayers can understand, Local Government Minister Rodney Hide announced on Wednesday. He released proposed changes to the Local Government Act which have been signed off by Cabinet. The Government is planning to make it easier for private companies to take over water and wastewater services from councils. Local Government Minister and Act leader Rodney Hide yesterday said “flexibility in delivery of water services” was part of changes to the Local Government Act 2002. Carisbrook Stadium Trust is 15 months out from the 31 July 2011 deadline. Dunedin’s stadium is not yet built, but it is already hosting a fiercely contested, high-stakes game. This game is a race against the clock, spurred on by the 2011 Rugby World Cup, with millions of dollars riding on it. Michelle Sutton talks to the home team, and looks at its opposition. The Dunedin Ratepayers and Householders Association is in recess until its future is decided. However, in a media statement the association said it had called a meeting because it had heard about unexpected stadium charges on rate demands. Association secretary Neville Poole said the assciation would meet at the Pioneer Women’s Hall on November 9. Orokonui Ecosanctuary officially opens Friday night after two decades in the making. Manager Chris Baillie said the $5m facility is officially opening at 6pm with a plaque unveiling by Otago Natural History Trust chairman Dr Ralph Allen and a keynote speech by acclaimed botanist Professor Alan Mark. Dunedin City Council is investigating a regional landfill to replace Green Island tip. The council has consent for its landfill until 2023. Otago councils are looking at a future regional facility in the Otago area. Hearing of oral submissions to the Dunedin City Council kerbside recycling collection system begins today. DCC solid waste manager Ian Featherston recommends council’s preferred option known as Option C. It advocates the retention of black rubbish bags and the blue recycling container, which will be used for glass recycling only. It also adds a lidded wheelie bin for other recyclables. With all the talk about council finances going into the red, an increasing Dunedin City Holdings Limited debt and proposed cutting of water and wastewater budgets it is surely a case of “I told you so”. The main objection to funding the new stadium by the majority of ratepayers and citizens is that it has effectively taken away valuable funds for the things that really matter in running a city like Dunedin. I am sick of reading about Dave Witherow moaning about our councillors. Just remember who went to court and lost and didn’t even have the money to cover the court costs, so who misled the people? I have been informed by a Dunedin City Council official that the new rubbish plan, Option C, is to cost about $2.4 million. As Contact Energy investigates future hydro schemes on the Clutha, Otago Chamber of Commerce chief John Christie believes Dunedin can step up and be New Zealand’s next hydro city. Tottenham Hotspur’s proposed new 56,250-seat home in North London has taken a major step forward today. Masterplanners MAKE, together with arena designers KSS and landscape designers Martha Schwartz Partners have submitted a planning application for the massive Northumberland Development Project backed by the Premier League club. The stadium will replace the club’s existing 36,000-seat White Hart Lane stadium with a new 63-row, single-tier stand, which could open as early as the 2012-13 season. The scheme, which was lodged with Haringey Council, will also feature a new hotel, housing, club shop and supermarket. The revised scheme was unveiled earlier this year. Anti stadium sentiments have been sprayed on a school mural recently added to the stadium wall, upsetting the pupils. Ravensbourne School pupils were the first group to paint a mural on the wall after an invitation by Keep Dunedin Beautiful. Anti-stadium sentiments spray-painted over a school mural on the Forsyth Barr Stadium construction site fence have left many at Ravensbourne School and the Dunedin City Council “horrified”. It’s here, it’s green, it’s one more visitor attraction the Dunedin community can delight in. It is a moment that has been more than two decades in the making, and for Dr Ralph Allen, Friday’s opening of Orokonui Ecosanctuary’s visitor and education centre will be a worthy tribute to the people who have worked on the project. The $2.2 million environmentally sustainable centre was designed “for free” by Dunedin architect Tim Heath. The opening tomorrow of the stunning visitor and education centre at the Orokonui Ecosanctuary caps off a remarkable project that has been a quarter of a century in the making. It would be difficult to imagine a more creative statement of intent and reflection of the values behind the ecosanctuary. TVNZ’s Close Up has produced a poignant, simply brilliant reminder of why we celebrate Labour Day in New Zealand. When Benmore and Aviemore and Clyde Dam were built, they had all the heavy equipment – trucks and diggers for a start. 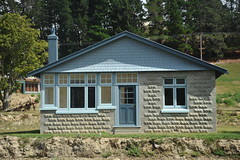 When they built Waitaki they had picks, shovels and crowbars and that was it. 75 years on the Waitaki Dam stands solid and proud. A monument to the men who toiled in harsh conditions, for not much pay and very little warmth, men like Arthur Wilson. He’s 100 now and believed to be the last man standing from those dam building days.